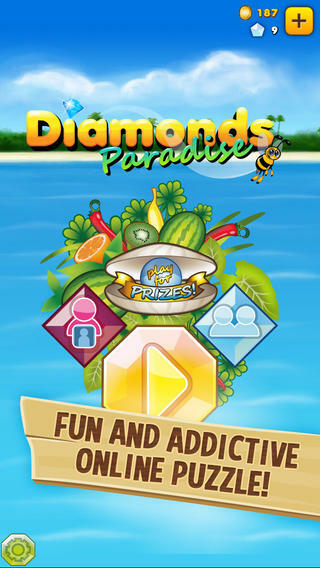 Diamonds Paradise is an iPhone game developed byStar Arcade Oy. 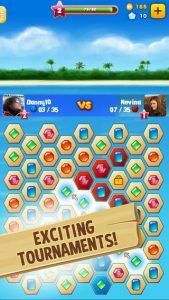 If you like competitive puzzle games, this is a title worth checking out…especially if you like a good freebie! Your goal is to “capture” 35 of the “cells” before your opponent does. To capture a cell, you need to slide your finger across the screen and connect at least three matching shapes in a row. As long as the cells are contiguous, you’re making a valid move: you don’t have to move just vertically or horizontally. The cells are hexagonal, giving you the ability to create some very long chains. Your turn lasts just 35 seconds, so you will need to think quickly to make the most of your move. Finding an opponent took me only seconds, so there wasn’t much waiting around to start a new game. At first brush, I found the interface a bit cramped and the menus a bit cumbersome. That being said, this game really sucked me in. The competitive aspect really inspired me to defeat my opponents, and I found myself playing around with this game for far longer than I do with other games I’m reviewing. 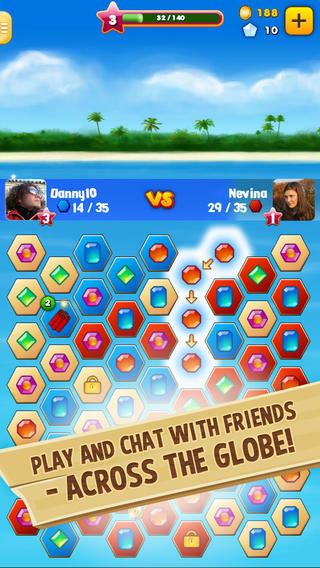 Diamonds Paradise lets you play one-on-one with your friends. There is a chat room if you want to hang out with your friends and trash talk during the game. There are also tournaments where you can battle players worldwide for a chance to win prizes. Current prizes seem to include Ray Bans, movies, and watches. This game has a lot of social appeal. 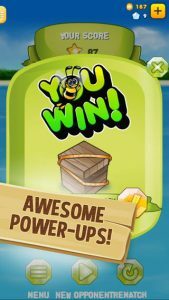 If you need a new time waster game to obsess over on your commute, this is hit. 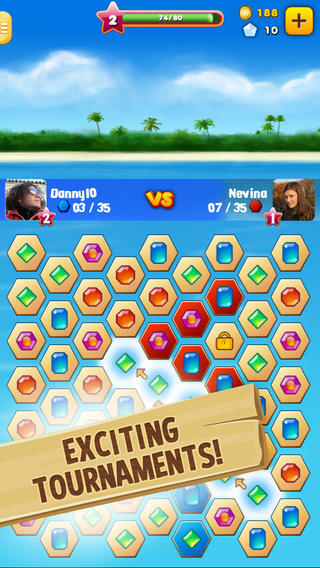 Be forewarned: Diamonds Paradise is way more addictive than you might expect. 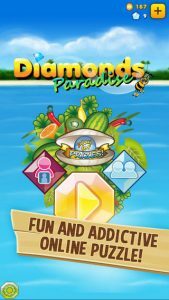 Diamonds Paradiserequires iOS 5.0 or later. Compatible with iPhone, iPad, and iPod touch. This app is optimized for iPhone 5.